See, it’s appropriate because Avatar‘s success has made Titanic references relevant again. And–seeing as it now seems that Sal’s got about as good of a chance of returning as popsicle Leonardo DiCaprio has of making it to America–because it’s a metaphor. That one’s for you, Sal. You’re here in my heart even if you won’t be on my TV anymore. This entry was posted on Friday, January 29th, 2010 at 5:20 pm and is filed under News and Television. 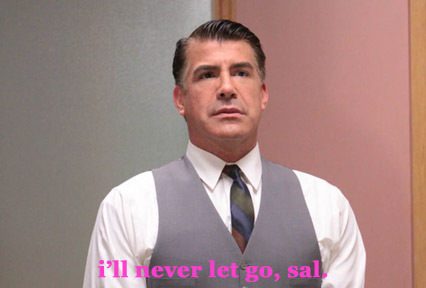 Tagged: Bryan Batt, Homo Things, Mad Men, Mad Men Season 3, Matthew Weiner, Sadness, Salvatore Romano. You can feed this entry. You can leave a response, or trackback from your own site. It is so sad. Maybe he’ll be back for season 5 or 6? Right? We have Shmathan to thank for that brilliant flourish.